Well...it's not set in stone fer the angle. The scrap steel stud was handy fer me to prop up the end at the time just to git an idea. What yer seeing mostly is the droop in the coroplast as it gits away from the steel stud. 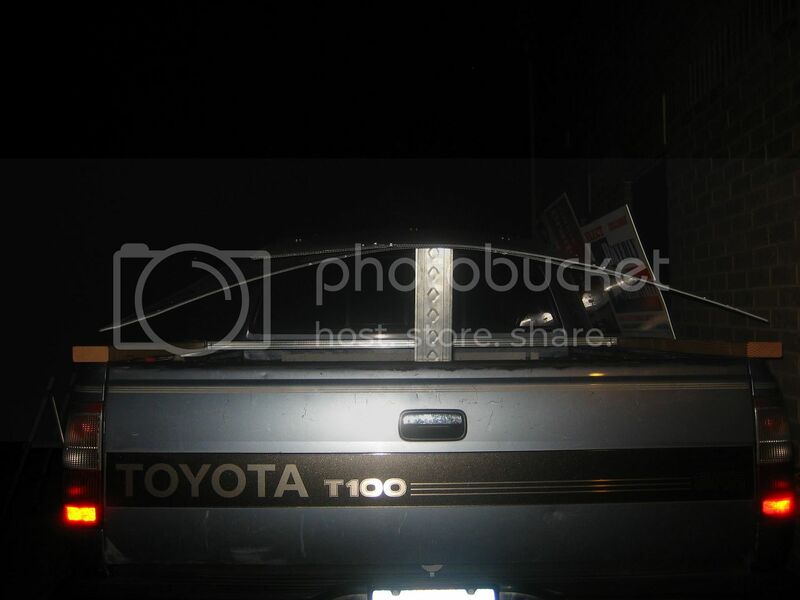 The height between the top of the tailgate to the coroplast is about 11" and the height from the bed to the top of the cab is about 21". The distance from the bed to the end of the tailgate is about 78". With the mockup as it is now...I can see pretty good out the back. 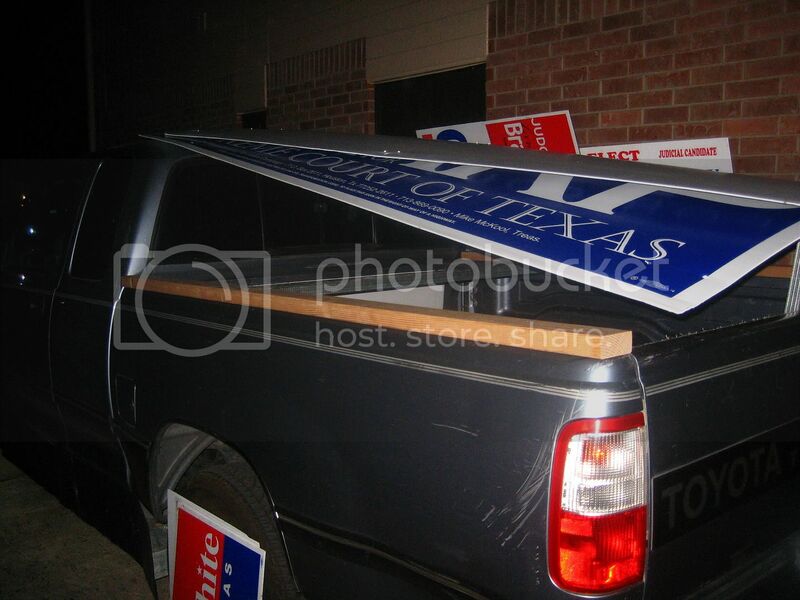 Keep in mind that the rake of my truck is rather...um...severe when compared to other trucks. I'll have to measure the rake angle at some time to give you an idea of what it is. You can see it in the "grid" piccie above (post #5). 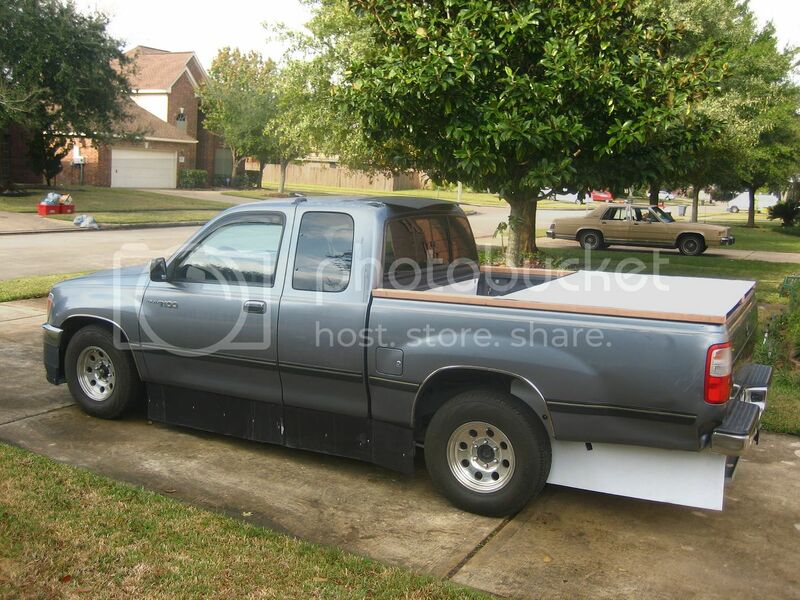 I'm still building up my half tonneau first and see how well that works out. 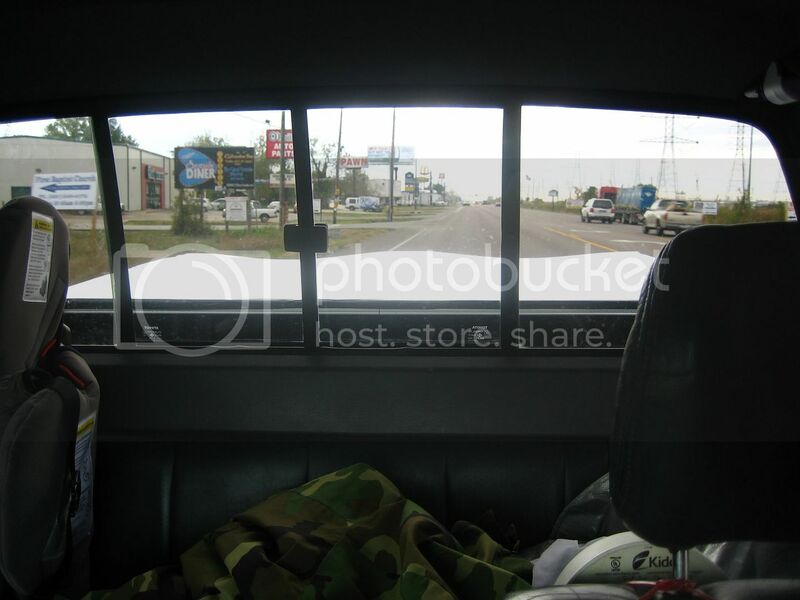 I really like seeing out the back window a lot compared to when I had the camper top on with the tinted windows. Last edited by BamZipPow; 12-07-2010 at 11:46 PM..
Is there any aerodynamic benefit to sloping from the center fer the rear part of the cap? It's doing it naturally because of the lack of support...but should I build it that way or should I put in a support beam to make it straight? Just did the math with my measurements. I add the calculated adjacent side to the original to git 118.85" and plug that back in to calculate the actual angle with the 11" rise from the tailgate. 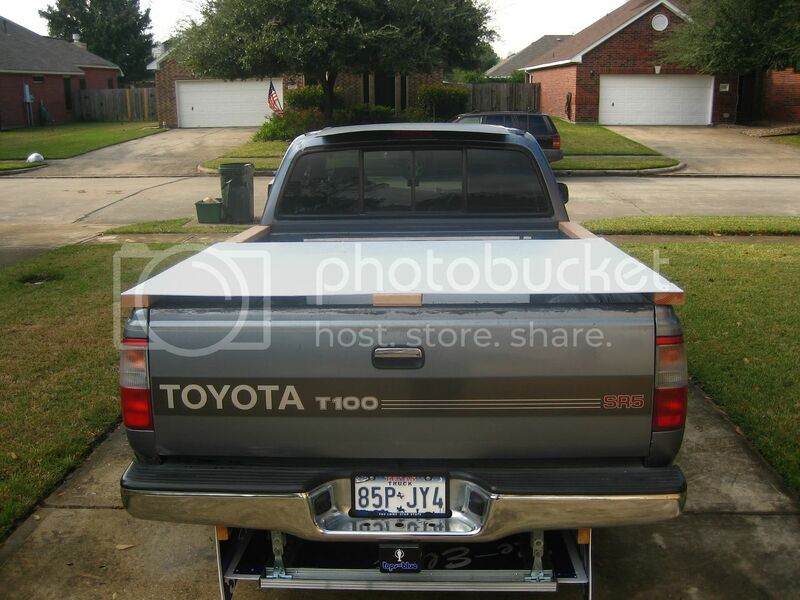 If the top ended at the tailgate...the angle would be about 15°. Since I have it up 11" from the tailgate, the angle is about 10°. It's all about wake reduction, and to max that, you want no wake on the lid, leaving only the rearmost vertical area- tailgate, bumper, etc.- with wake behind them. If the lid has too much angle, flow separates on it and the lid becomes part of the wake zone. If the lid has not enough angle the upper part of it won't be part of the wake zone (good) but the rear area won't be minimized hence it's overall effectiveness won't be maximized. So I should try to keep this natural curve? It looks quite nice... perhaps that post could be lowered some? 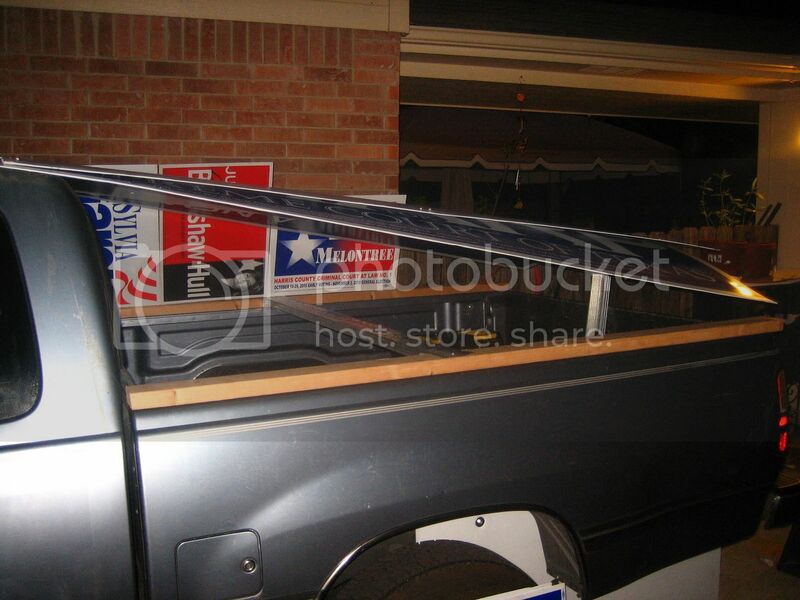 Got the half tonneau sheet put on...just 4 screws in the corners and some duct tape on the front edge. I think we fall into a trap sometimes when quoting an "ideal angle" for a trailing surface. I think it depends on the other geometry around it. For instance, since yours has such a smooth organic taper rather than a sort of 2-D slice off an airfoil profile, I think the angle can be steeper- like how the EV1 backlight is steeper than our "ideal" aero template. If you can make it adjustable and do tuft tests, that would be the best way to optimize that angle, moreso than us sitting around theorizing about it. Last edited by BamZipPow; 12-08-2010 at 02:37 PM..